Alpha Omega Integration has a new vice president of business development: Larry Henderson, a 21-year veteran of the Air Force, who brings to the role over 38 years of experience in personnel, administrative and technical program and project management. Henderson will be tasked with growing Alpha Omega’s business across a variety of sectors and work environments, leading business development activities including capturing, responding to proposals, pre-RFP planning, proposal submission and post-proposal lessons learned, according to the company. Henderson has experience managing complex IT solutions and has supported IT, data analytics and application development projects, including e-learning projects and professional services, to a wide range of government customer agencies, according to Alpha Omega. Henderson has worked in service of the JIEDDO SharePoint Development and Deployment Program, the State Department IT help desk consolidation, State Department internet to the desktop, OPM Consolidated Leads (Records Check), Army G6/CIO Enterprise Licenses, and DOD Office of the Inspector General CIO A&AS. In the Air Force, Henderson was an information management officer, supporting the White House, the Joint Chiefs of Staff and the Air Force’s secretary and chief of staff. He directed many major nationally televised events, such as the B-2 Stealth Bomber naming ceremonies, the arrival ceremonies honoring the 19 airmen killed during the Khobar Towers bombing, and the repatriation of the Vietnam-era fallen airmen at Arlington National Cemetery. He was also part of the team that planned and directed over 100 events celebrating the landmark 50th birthday of the Air Force. 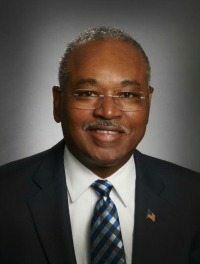 Henderson holds a master’s degree in management from Webster University, St. Louis, and a bachelor’s degree in political science – criminal justice from Auburn University, Alabama.